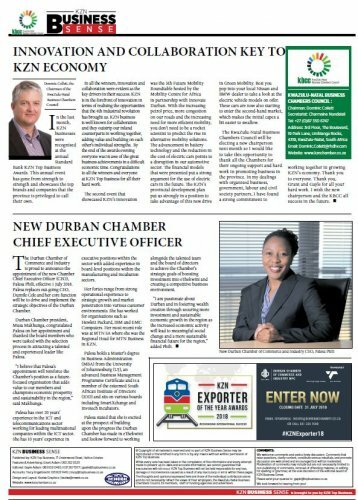 The Durban Chamber of Commerce and Industry is proud to announce the appointment of the new Chamber Chief Executive Officer (CEO), Palesa Phili, effective 1 July 2018. 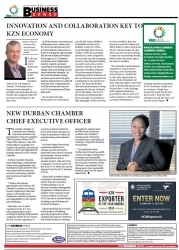 Palesa replaces out-going CEO, Dumile Cele and her core function will be to drive and implement the strategic objectives of the Durban Chamber. Durban Chamber president, Musa Makhunga, congratulated Palesa on her appointment and thanked the board members who were tasked with the selection process in attracting a talented and experienced leader like Palesa. "I believe that Palesa's appointment will reinforce the Chamber's position as a futurefocused organisation that adds value to our members and champions economic prosperity and sustainability in the region," said Makhunga. Palesa has over 20 years' experience in the ICT and telecommunications sector working for leading multinational companies within the ICT sector. She has 10 years' experience in executive positions within the sector with added experience in board-level positions within the manufacturing and incubation sectors. Her fortes range from strong operational experience to strategic growth and market penetration into various customer environments. She has worked for organisations such as Hewlett Packard, IBM and EMC Computers. Her most recent role was at MTN SA where she was the Regional Head for MTN Business in KZN. African Institute of Directors (IOD) and sits on various boards including SmartXchange and Invotech incubators. to achieve the Chamber's strategic goals of boosting investment into eThekwini and creating a competitive business environment. change and a more sustainable financial future for the region," added Phili.